Leslie Gould, a former magazine editor, is the author of numerous novels, including Beyond the Blue and Garden of Dreams. She received her master of fine arts degree from Portland State University and lives in Oregon with her husband, Peter, and their four children. 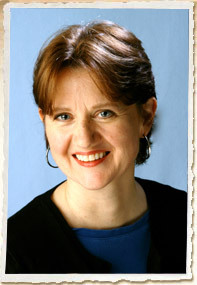 Leslie Gould is a professional author with a background in magazine journalism. She grew up in the small farming community of Pomeroy, Washington and earned a degree in history and communications from Judson Baptist College. She also holds a master of fine arts degree from Portland State University. In this interview, we’ll get to know Leslie as a person and as a writer, as well as learn about what led her to write her first Amish fiction novel. Enjoy! So, Leslie, can you give us “you” in a nutshell? Try to describe your life in a paragraph (but if you need to use two paragraphs, that’s OK). How about three?! I’m definitely a member of the “sandwich” generation. My elderly father lives in a nearby care center, and I take him to his appointments and try to see him as much as possible. My husband, Peter, and I have four children and all are at home—the youngest is 13 and the oldest is 23. The 13-year-old plays club soccer, which means lots of practices and games and trips. I always take my laptop along and write during practice and the hour-long warm ups before games. It’s crazy but it works—every hour of writing helps get a book done! Peter is in the Army Reserve and was just promoted to colonel, which people say makes me a general since supposedly I out rank him. The Army Reserve definitely adds another twist to my life, but a very important one. I’m proud of Peter and thankful for his service. Besides the Lord, my family, and all the good friends that I’ve been blessed with, the thing that makes me the happiest is writing a story. I feel such harmony when I have a stretch of six or seven hours to just write. It’s pure bliss when it all comes together and the words flow. (It’s the same feeling I have when reading a good book.) Of course there are plenty of days when the words don’t flow but the interruptions (mostly self-inflicted) do—so I’m always very thankful for that sense of harmony when it does happen. What are your favorite things to write about, and what inspired you to write in the first place? I love writing about families, friendships, and other cultures—which made the leap to Amish fiction very enjoyable. As far as my inspiration to write, I’ve always been intrigued with the process of writing and storytelling. The first word I ever wrote was “sky.” I was four and thought it was absolutely magical. I also used to make up stories about the alphabet when I was little. Each letter was a character with its own personality and there was conflict between some of them, especially those next in “line” to each other—although I don’t think I ever got as far as actual plots in those stories. By junior high and high school I was keeping a journal (oh, the drama) and writing short stories (pretty bad stuff) and poetry (really bad stuff). After college I did PR, curated a museum in Ashland, Oregon, worked for the Port of Portland, and later was the editor of a bridal magazine, along with writing freelance articles. I enjoyed the nonfiction writing that I did in all of those jobs, but what I really wanted to do was write fiction. I’d write scenes and character sketches and had ideas for novels, but it wasn’t until Peter’s unit was deployed to Germany in 1990 that I finally took a fiction writing class and started finishing short stories and working on novels. One thing led to another…ha! Not really. One year of writing fiction led to another year of writing fiction, and although I had a couple of short stories published and I placed in a couple of competitions, it was 10 years from the time I took my first fiction writing class until I sold my first novel. What interested you in Amish fiction to the point that you said, “I want to write an Amish series!”? 23 years ago when our oldest was a baby, Peter and I loaded up our VW van and the three of us took a six week road trip around the US. (Yes, we were crazy, but we didn’t know it at the time—and our little guy turned out to be a good traveler, thankfully.) Peter had lived in Pennsylvania as a boy and remembered visiting Lancaster County, so that was one of our stops. We ate shoofly pie, shopped in a couple of stores, and took photos of beautiful quilts hanging on clotheslines. It was absolutely fascinating. Fast-forward a few years. Our next two babies were born at home in Portland and I started reading everything I could about midwifery, including A Midwife’s Story by Penny Armstrong, who was a midwife to the Amish. It became one of my favorite books and as I read it and reread it, I came became more and more fascinated with the Amish women and their stories. When/how did you team up with Mindy Starns Clark to write the Women of Lancaster County series? From the first Amish farm we drove by, I was absolutely hooked. I found it even more fascinating than I had 23 years before! What are some significant events in your life story so far? Being married for 27 years is one of the most significant “events” of my life. I’ve been blessed with a good man who is willing to work hard at this ongoing endeavor. We keep growing and learning and moving forward. Being a mom is also one of the most significant and challenging ongoing events of my life. I tell people that parenting and writing are two of the most humbling things there are (but also two of the most rewarding). Another significant event was adopting our youngest child from Vietnam. I took the emotions of that experience and turned them into a fictional story, which ended up becoming my novel Beyond the Blue. I turned the emotions of another significant event, Peter’s Army service and the impact on our family, into the novel Scrap Everything. Like most writers, my significant events find their way into my writing, but some are definitely more obvious than others. What’s something you still hope to do someday? I hope to go back to Vietnam and work in an orphanage or do some other type of service there. I’m fascinated by the stories of Vietnam and have been since I was a child, and I would like nothing more than to make a contribution to the people there. After our kids are all grown, I hope Peter and I can do short-term missionary trips to wherever God would have us go—but I do hope Vietnam is one of the places. Which household chore do you dislike most? Unloading the dishwasher (yes, I would rather clean toilets and empty the cat box than unload the dishwasher—can’t explain it, but it’s true). What do you think you would like best and least if you were to “go Amish”? I would definitely like the family working together the most and stopping school after the eighth grade the least. Do you collect anything? Books, books, and more books! I’m basically a book-a-holic. What’s your favorite book? How about my favorite story and my favorite book? My favorite story is “Jonah and the Whale.” I’ve loved it since I was little. Isn’t it a shock when the whale swallows him? Can you imagine? And then Jonah keeps on whining, even after all he’s gone through. It’s such an applicable story. My favorite book is To the Lighthouse by Virginia Woolf. I first read it in college and have read it several times since. I love the domestic yet enchanting setting and the stream of consciousness writing. She was brilliant. Anything else that you want to tell us? I’m very excited for the release of The Amish Midwife! Writing with Mindy has been a wonderful, collaborative experience. The characters are unforgettable and I love the way the plot twists and turns. I can’t wait for people to read it!